Now that you’re engaged, and the process of wedding planning is in full swing, it’s time to choose your wedding stationery. 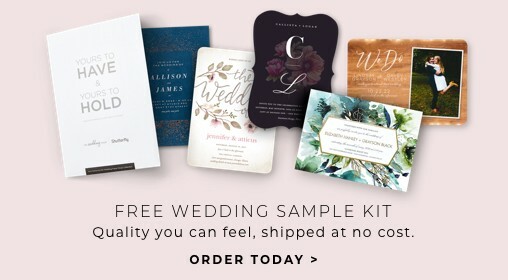 We know you want your wedding invitations to be unique and tailored to your style as a couple. Give your friends and family a chic first impression of your big day with stylish, personalized wedding invitations, response cards, enclosure cards and more. 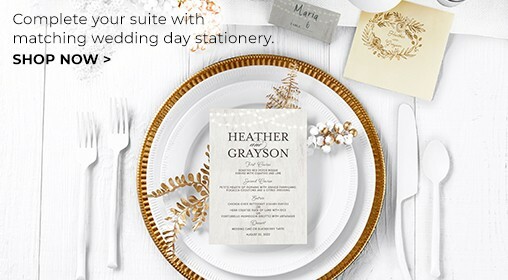 With custom options available exclusively from The Wedding Shop by Shutterfly, it’s easy to create a memorable, custom suite of elegant invitations and cards for your wedding day. Customizing a matching set of wedding stationery makes for a beautiful experience for your guests, from start to finish. From their very first glimpse of the envelope to sending back their RSVP card, your recipients will delight in the luxurious paper and coordinating styles you’ve chosen for your special day. 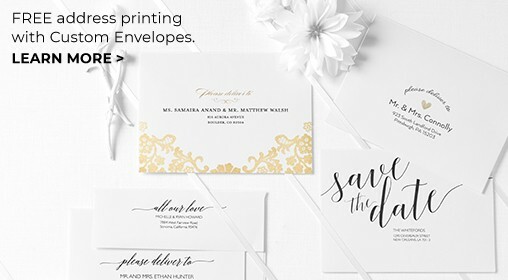 Select your favorite wedding invitation design from our collection of curated templates, and easily personalize the matching response cards, enclosure cards and reception cards that fit perfectly with it. Every aspect of your wedding should be designed your way, down to the smallest details. It’s important that your stationery reflects the theme, colors and aesthetic you’ve chosen for your ceremony and reception. With The Wedding Shop, it’s easy to find invitations that suit your style and taste. Choose from classic, vintage, rustic, modern, whimsical, artistic and photo designs to bring your wedding inspiration to life in your way. If the traditional just isn’t for you, take your stationery a step further with premium wedding invitations. Opt for a touch of flair and extravagance with shimmering foil or glitter invitations, or choose luxe stationery from our Wedding Paper Divas collection to achieve the style you love. Whether you prefer a classic look or a glamorous one or something in between, your wedding stationery can be personalized down to every detail. Choose from versatile options, including colors, fonts, layouts, trim styles, backgrounds, and photos. Customize the wording or stick with the suggested template to give each card your desired look and feel. When finished, preview every component to ensure your wedding stationery suite is flawless from beginning to end—just as it should be. Your wedding suite isn’t complete without the final stationery and accessories that tie it all together. Make your invitations chic both inside and out with envelopes in coordinating colors, optional slip-in liners and more. Personalized address labels or self-inking stamps instantly give your envelopes a custom look and take the hassle out of mailing. Browse a variety of designs to find your favorites and give your stationery a cohesive elegance through and through. 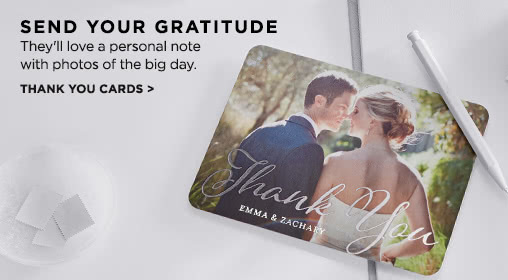 After the big day, showcase your favorite wedding photo and express your gratitude to family and friends with stylish wedding thank you cards. Finally, top off the occasion with more good news—choose from moving announcements that let your loved ones know about the next big milestone in your lives together.